When in Italy last year visiting dad’s home town of Quintodecimo and using it as a home base, our usual daily routine consisted of: Wake up, jump in the car, drive to an ancient walled town, visit the local church, have a pizza or pasta in town, eat a gelato, drive home, cook a meal with fresh produce form our uncle’s garden, sleep and repeat. It was a wonderful way to experience Italy and while at the end we were craving salad, the endless supply of pizza was heavenly. Like any other self respecting Italian, I am a lover of pizza and pasta, and really do wish that I could eat it every day. So, when the cauliflower pizza base starting making rounds on the internet, instead of sticking my nose in the air in defense of “traditional” pizzas… I embraced the idea of a non-carb gluten free version and made my own cauliflower pizza base. In fact, I loved it so much that cauliflower pizza bases are now a weekly occasion in our household. It means that I get to eat pizza more often without feeling guilty. The premise is simple, whizz up raw cauliflower in a blender to make rice/quinoa sized pellets, boil it in water till tender, squeeze all the excess water out in a cloth, mix with an egg and some other ingredients to add flavour, then spread on a pizza tray and bake till golden (see below). The resulting base is surprisingly tasty. Thin and crisp on the edges like a flour based dough, yet light and satisfying without leaving you in a pizza coma. We top ours with many different indgredients, with our favourite two pizzas being: 1. pesto, ham, mushroom and parmesan; and 2. tomato sauce, sundried tomato bocconcini and basil. Preheat oven to 200° Celcius. Place raw cauliflower florets in a food processor and pulse till they are the size of rice grains (you may need to do this in two batches depending on the size of your processor). Bring 1/2 medium sized pot of water to the boil, then add the cauliflower and cook for 5 minutes covered. Drain the cauliflower in a strainer, then transfer to a cloth and squeeze out the excess water. You want the cauliflower to be as dry as possible. Transfer cauliflower to a large bowl. Add egg, cheese, parsley, salt and pepper and mix very well. Line two pizza trays (32cm) with parchment paper then divide the mixture in two and place on the prepared pizza trays. Using your hands, press the mixture out on the baking trays evenly until it almost reaches the edge of the trays. Transfer to the oven and bake for 25-30 minutes, or until the base is golden in colour. Remove from oven and top with your favourite ingredients and cheese, then bake again for 5-10 minutes until the cheese has melted. Every time in try to make this it’s a bit too mushy. I haven’t precooked and squeezed liquid out as per you recipe. Will give this a try. I really should try this — I’ve read about it often enough, and it sounds like such a great idea. Your version looks terrific! Thanks. wow this pizza looks amazing! i definitely need to try the recipe, pinned! So yummy! That appears amazing. Recent Post: Jak dobrać na wyjście skórzane buty? Is there a version of this that doesn’t use any cheese? Hi Jillian, If you want to find a version without cheese just google “Vegan Cauliflower Pizza Crust” and there are a few options that you can try. OK Amanda you sold me on this! I am definitely going to try it. I was one of those that did scoff at this when I first started seeing it make the internet rounds on Pinterest and the like, but you made this look so appetizing I must try it. Your toppings and look delicious as do the photographs! Thanks for making me re-think this one. Looks good, but, does it still taste like cauliflower? I’ve never eaten pizza and felt guilty. Yes, sometimes I’ve overdone it and made an absolute swine of myself, but the guilty thing never happens. I’ve seen the cauliflower base thing a lot lately and am intrigued by it. I love cauliflower so I reckon I’d like it. Not as much as that glorious thin, blistered and slightly chewy wood-fired pizza base, though. Mmm. Is it getting hot in here? This looks fabulous, we eat cauliflower rice a lot so I will try this next! 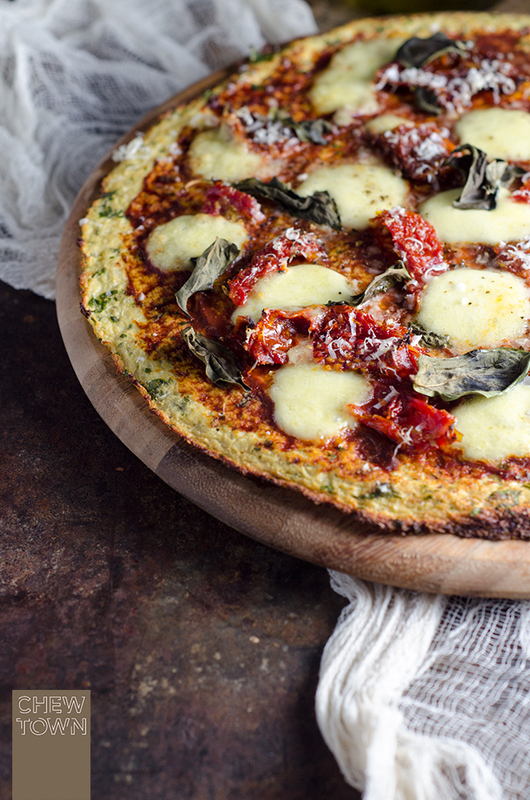 That is the first cauliflower pizza I really want to try! This will be my lunch tomorrow. Your photography is breathtaking! I am normally not a fan of cauliflower, but this looks so good and It’s making me want to give it a try! What a great way to experience Italy! I love pizza so much I could eat it every day too! PLEASE use parchment paper instead of wax paper as the recipe calls for! I followed the directions to the letter and the crust fused with the wax. I had to turn the whole beautiful pizza upside down and peel off the back. It tastes delicious, but the “pizza” aspect of it wasn’t worth it at all. Hi Sumner, in Australia, baking paper is parchment paper – we don’t have wax paper here at all. Apologies that the recipe was confusing. I’ll change the method to make it easier for people in other countries.